You haven’t seen many new posts from me lately. Between the East Coast Excel Users Conference at the end of September and the Excel Visualization and Dashboarding Boot Camp last month, I’ve been busy. And it seems that each week away sets me three weeks further behind schedule. I have plenty of topics I’m working on, or at least, written on my to-blog list. But I thought I’d get back into the swing of regular blogging with a post about the perils of scholastic aptitude tests (SATs, used by most US colleges and universities as a criterion for rating applicants for admission). My youngest daughter took her PSATs last month; results are pending. My middle daughter took her first SAT Reasoning Test in the spring, and beat my old math score, but was disappointed by the language score. She repeated the Reasoning Test this weekend. She took the SAT Subject Tests last month and scored well in her three subjects. So this is a topic that’s on everyone’s mind in my household (except for my oldest daughter, who is in college and beyond all that — until the GREs). 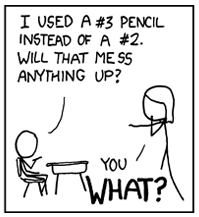 The warning is provided by our friends at xkcd in a post entitled Scantron. The following is just an excerpt; when you visit the site, don’t forget to mouse over the image for more information. 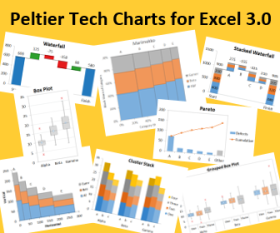 I hope to start posting on Excel and graphics topics today, though it may take a guest post to get started. Posted: Monday, November 3rd, 2008 under Amusement. You are an asset to the Excel community, but also a human, a father, a husband and a business owner. You sound like you deserve a rest. I still check in every day, because old posts get comments and I can always learn something. Thanks, but you left out homeowner. I spent the weekend digging up the last section of the front walk, to put in the proper base that the previous owner neglected. He did a nice job with the pattern of paving stones, but laid it down right on the ground, and it has settled. I’m also replacing the crumbled flagstone he used with thick limestone steps. The walkway is 50-60 feet long, and rises a total of a dozen steps. I’ve been working on it since the 90° days of August (last night it was 35° when I knocked off in the dark at 5:30 pm), and it’s done up to the last step, and looks great. Of course the crew season has cut into available working days. All three daughters row, and each event takes essentially the entire day. The SAT was renormalized a few years. An 800 just doesn’t mean what it used to. You can now get an 800 and still get a few wrong. I read about the scoring changes. In addition, there is some variability from year to year because the questions (nominally the same) may have different difficulties. Anyway, I don’t mind admitting that she’s smarter than I am. Ha! Thanks for the link. I had totally forgotten about that site.